We wanted a creative, awesome costume for our very energetic 15 month old son! 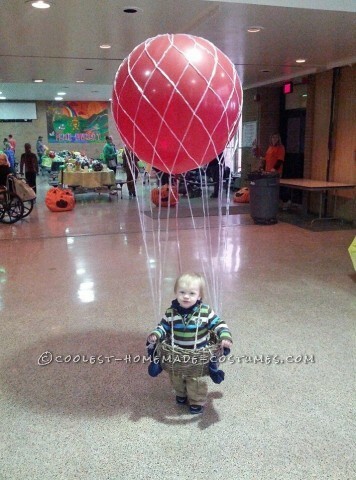 We decided on the Hot air balloon costume!! We got a basket, cut out the bottom. Ryder LOVED playing with the basket and ran around the house carrying the basket! We had to get a 3 foot balloon, which was a challenge because when I asked the sales associate at the local party shop for a 3 foot balloon, she looked at me and said they didn’t have any that large! So I asked what the largest size balloon they carried, she replied 36 inch balloon…so I let her have a moment to figure it out, thankfully she stated, “I guess 36 inches is 3 feet…” And we were on our way! He did such a great job walking with the costume on, he was such a champ! People were so excited and surprised to see a hot air balloon at their front door!